We had a busy weekend, both around the house and around the town. But somehow we were able to check out three new (at least to us) restaurants. On Friday afternoon I met an acquaintance for tea at The Steeping Room. We had a few things to talk about and since neither of us drinks coffee, she suggested we do The Steeping Room. While the restaurant does high tea, we opted not to do that and instead selected from the dizzying array of individual teas. I ordered a chocolate chai frappucino and my acquaintance ordered the iced tea version of a mojito. Both were yummy. However, the reason this place is blogworthy is the service. My acquaintance ordered a chilled watermelon soup; however, she’s pretty reserved and didn’t mention that she didn’t like it. I admit, I didn’t even notice she hadn’t eaten it. After the bill was paid, the waitress came back to the table and said her manager noticed my acquaintance didn’t eat her soup and was something wrong. The waitress offered to take it off the bill. When that didn’t work because the credit card had already been run, the waitress gave my acquaintance a coupon for a free soup on her next visit. One little act of customer service gained two return visitors. That evening, Doug and I went to another new place, Gypsy, on Barton Springs Road. This quaint northern Italian restaurant had great wine, food and service. The waiter was excellent, giving great suggestions and allowed us to sample a few wines before we made our selections. In fact we discovered a few new wines. We split a dessert, a chocolate mascarpone cheesecake – it was rich and almost too much. We had an ice wine to go with it that tasted like apricots soaked in honey. Yum! We didn’t make it to a new restaurant on Saturday, although we did have an enjoyable meal at El Sol y La Luna. Not only is the food good there, the restaurant is quick (in and out in under 40 minutes), which was good because we were on our way to volunteer for the Zach’s production of Seussical. BTW, the production had great costumes and great performances. This morning was our third new restaurant – Galaxy Café in the Triangle. Cute little restaurant and good food. I had the Mediterranean eggs, with feta and basil. While there was nothing “oh wow” about the breakfast, it hit the spot and we’ll definitely return. Maybe we’ll even make it back for lunch or dinner. All in all, a good gastronomical weekend. In our never-ending hunt for great barbecue, yesterday we decided to try Snow’s BBQ in Lexington. The June issue of Texas Monthly named Snow’s the best ‘cue in Texas. The joint is only open on Saturdays and only until the meat is gone. We tried going a couple of weeks ago when the magazine first came out, but thanks in part to the scenic route that Doug mapped out (I love him, but he can’t navigate) we were too late. This time, however, we were prepared. Not only did I navigate, I also called on Tuesday to pre-order our meat. According to a recent blog update on Texas Monthly, Snow’s has increased it’s production from 300 to 800 pounds of meat on Saturday; the only way to ensure you get barbecue is to pre-order by Wednesday. The Statesman’s John Kelso wrote that the barbecue is selling out in 45 minutes and that people are coming Dallas, Houston and Laredo to taste the barbecue. We said that we would pick up the meat at 10:15, so we left the house about 9 a.m. with a mixture of excitement and trepidation. We were looking forward to the best barbecue in Texas but were worried if they could keep up the quality when their production has almost tripled in less than a month. It took us about an hour to get there by peaceful back roads through Elgin (FM 3000 is a cute little road). When we arrived, the place wasn’t too crowded, but it certainly had its share of confusion, like the aftermath of a natural disaster. The two ladies working the counter were explaining to people that all they had left was sausage. There was a line at the door when the restaurant opened at 8 and by 9 they were sold out. Needless to say, there were a lot of disappointed people who walked away empty-handed. While waiting for our turn, I peaked at their guest book and they had folks from as far away as San Francisco. Hmm. Our order was already pre-wrapped to go and it took a bit to explain that we wanted to eat a bit there and then take the rest with us. Finally, we got it straight and went outside to eat and watch the pit masters. We were eager with anticipation. Although the brisket looked dry, Doug thought it was deceptively moist and tender. I thought the pork was juicy. However, it seemed like I got the dry end of the brisket and he got the dry end of the pork so I didn’t like the brisket as much as he did and he didn’t like the pork as much as I did. We both thought the sausage was okay and the pork ribs were over done, bordering on being horrible. On the drive home (via Taylor – another nice drive) we discussed Snow’s. Overall, we rated it okay but probably won’t be in a hurry to get back. As Doug pointed out, however, that most barbecue places have their off days and this might have been one of those. Also, it may have been that all the meat is scheduled to be ready at 8 and the extra two hours of waiting for us caused our order to dry out. It could also be that they couldn’t keep the quality up with the production increase. At some point, once the Texas Monthly hype wears down, we’ll try Snow’s again. Maybe then it will live up to being the best barbecue in Texas. I'm now on the board of directors for the local chapter of the Association of Women in Communications. In preparation for this weekend's planning retreat, I took the Myers-Briggs personality assessment. I've taken these tests before, but I was curious to see if anything had changed since I last took the test in grad school. It hadn't. I'm an ENFP. ENFPs are introspective, values-oriented, inspiring, social and extremely expressive. They actively send their thoughts and ideas out into the world as a way to bring attention to what they feel to be important, which often has to do with ethics and current events. ENFPs are natural advocates, attracting people to themselves and their cause with excellent people skills, warmth, energy and positivity. ENFPs are described as creative, resourceful, assertive, spontaneous, life-loving, charismatic, passionate and experimental. So what do you think? Does this sound like me? Dexter, aka Mr. Keep Your %@#& Hands Off Me, was letting me rub his belly and enjoying it. Not sure what's up with that. Go figure. 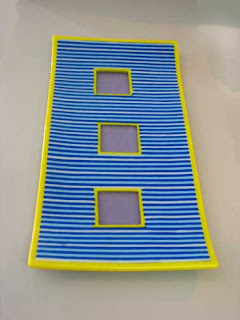 This spring I found a great fusing center, Helios, and have been taking classes galore. So many class projects in fact, that I've had little free time to fire up my own kiln. In fact, I still to finish this awesome paper weight from a class that ended in April. I think the classes are paying off and my work is going to a new level. Below are a few of my projects from this spring. They aren't representative of all the classes I've taken (some classes are technique classes), but you can see how the work has progressed. This is from a powders and frit class. I used frit (small pieces of glass) to recreate a scene from Hawaii. Aloha! 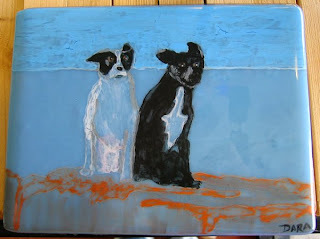 This was an enamel painting on glass class. You trace a picture on the glass and then paint in the detail. These are the dogs on the jetty at Port A.
Doug also took the enamel class; in fact, he got way more in to it than I did. This is Umlaf Sculpture Garden in Zilker Park. My hand, from a textures class. 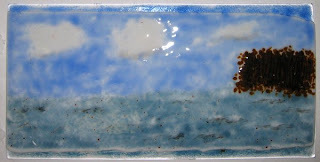 You use kiln wash to make a design and then place glass on top. I made this for Doug's birthday. Project one from the paper weights class. This takes a lot of cold working, which means using power tools to shape and polish. Woven bowl -- pieces of glass that look woven together. 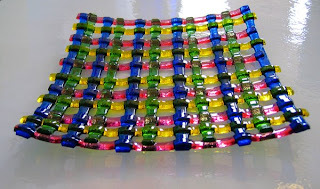 There was also another project where the glass is actually woven together, but the piece isn't finished yet. Strip bowl. You cut strips of glass and then turn them on their edge for a different look. Of course, I have more classes on the horizon.On Sunday I start a two-week mica and enamels class -- not painting, but using mica and enamel powders to create art. 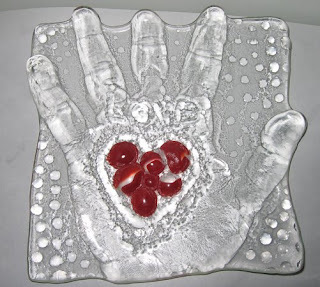 The hand piece here is a great example of using micas. Thursday is the start of a pattern bars class, where you fuse glass together to make interesting elements for other pieces.